Advanced 3D Laser Solutions is a company with over 40 years’ experience working in the Oil & Gas industry , establishing us as the leading company in 3D laser scanning and processing technologies. This sets us apart from other general surveying companies who offer 3D laser services without our engineering expertise. Our developed clients are reassured from working in partnership with ALS, a company whose employees understand the oil and gas industry and the challenges this presents. The result being that ALS has been able to grow steadily as demand for our specialised services increase. Part of our current ALS team are pictured above. The following text explains the stages to build a 3D spec driven model from start to finish. Essential for all planned surveys, often accompanied by a site visit to establish site conditions and to establish site arrangements beforehand, ALS will determine an overall number of scans required. In doing so ALS will arrive at the optimum surveying team size along with a number of instruments to be used to complete the 3D laser scanning. Since majority of our surveys are carried out on oil, gas and chemical process sites, a higher level of safetymandatory. Our surveyors have completed CCNSG / CCNSG team leader training, some having completed Confined Space and First Aid courses. Our PPE is selected to exceed the requirements laid down for working on sites where both flammable and corrosive chemicals exist. ALS Operations work with client’s safety representatives in preparing our RAMS documents and because of our engineering background, can discuss and agree where additional safeguards are necessary. With the pre-planning, risk assessments and method statements are in place, ALS will agree a start date with client. On arrival ALS team will normally expect to complete specific site induction before receipt of the permit to work. The ALS team leader will have briefed the client on the surveying strategy and client will share current site considerations that may affect the days work. A small 120,000m2 terminal usually takes around 4 days to complete our 3D laser survey. Our experienced team knowing where and how particular scans are required to capture specific engineering detail essential for achieving accurate deliverables. 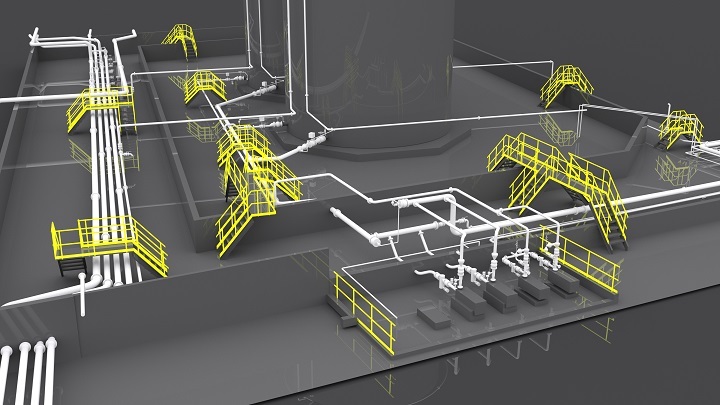 An important deliverable, aside to the 3D laser scanning, is often to collect data enabling completion of process and instrumentation diagrams (P&IDs). On these occasions our team will be supplementing scan data with our Go-Pro videos that collect specific data plate information along with instrumentation connections. Having collected the 3D laser scan data, the files will need to be registered. This process brings together the individual scans to form a completed site file. For larger sites we will often divide the site down in to discrete areas, with link scans used to connect the individual areas. For larger sites ALS are registering over 200 scans each day and on these occasions the registration process starts each. Again, with ALS having the experience of working with large scan data files, our company has developed techniques that sets us apart with this technology. Where ALS are required to prepare pipework models, our company has developed processes that can automatically detect the pipework ahead of modelling. The extraction process identifies both centre line, size and gauge. Once ALS complete the filtering and clean-up of detected pipework, the file is ready to be loaded in to our Autodesk Plant 3D modelling software. This automatic detection process saves considerable time otherwise manually extracting pipework detail to the benefit of our clients. Our modelling software is specification driven. Being specification driven, once ALS establish with client the appropriate specification, this is selected from a range of piping standards in our 3D modelling software. Having covered all standard flanges, fittings and components, client may have equipment not included within the modelling software catalogue. With ALS’s engineering background, we quickly identify and can develop new components for inclusion in the software catalogue. The catalogue includes pipe supports which when requested by client, can be included in the 3D pipework model. A facility within our Auto pipe recognition software, includes a steel work extraction. Again, our software can identify from all standard steel sections allowing this to be added in to our 3d model files. Once the detailed spec driven model is complete we can number the pipe lines using whatever nomenclature standard the site / client requires.